Copolymers are manufactured to include a zwitterionic monomer (e.g., methacryloyloxyethyl phosphorylcholine monomer), a dihydroxyphenyl derivatized monomer, and optionally one or more additional monomers. The dihydroxyphenyl derivatized monomer gives the copolymers excellent adhesion properties. Optional monomers include a cationic amino monomer, a hydrocarbon monomer, and/or a hydrophilic monomer. The copolymers are biocompatible and can be used with medical devices. This application claims the benefit of U.S. Provisional Patent Applications Nos. 60/866,800, 60/866,802, 60/866,804, 60/866,805 60/866,798, 60/866,797, 60/866,796, 60/866,792, all of which were filed on Nov. 21, 2006, and all of which are hereby incorporated by reference in their entirety. This application is related to co-pending U.S. patent application Ser. No. ______, entitled “Methods of Manufacturing Copolymers with Zwitterionic Moieties and Dihydroxyphenyl Moieties and Use of Same” (Attorney Docket No. 17066.19.1), co-pending U.S. patent application Ser. No. ______, entitled “Zwitterionic Copolymers, Method of Making and Use on Medical Devices” (Attorney Docket No. 17066.20.1), co-pending U.S. patent application Ser. No. ______, entitled “Amino Acid Mimetic Copolymers and Medical Devices Coated with the Copolymers” (Attorney Docket No. 17066.23.1), co-pending U.S. patent application Ser. No. ______, entitled “Methods for Manufacturing Amino Acid Mimetic Copolymers and Use of Same” (Attorney Docket No. 17066.24.1), co-pending U.S. patent application Ser. No. ______, entitled “Copolymers Having 1-Methyl-2-Methoxyethyl Moieties” (Attorney Docket No. 17066.25.1), and co-pending U.S. patent application Ser. No. ______, entitled “Methods for Manufacturing Copolymers having 1-Methyl-2-Methoxyethyl Moieties and Use of Same” (Attorney Docket No. 17066.26.1), all of which were filed on Nov. 19, 2007, and all of which are hereby incorporated by reference in their entirety. Co-pending U.S. patent application Ser. No. 11/939,512, filed Nov. 13, 2007, and co-pending application Ser. No. 11/562,338, filed Nov. 21, 2006 are hereby incorporated by reference in their entirety. Embodiments of the invention relate to biocompatible copolymers and medical devices coated with the copolymers. More particularly, embodiments of the invention relate to copolymers having zwitterionic monomers and monomers with dihydroxyphenyl moieties. Recently, polymers containing 2-(methacryloyloxyethyl)-2′-(trimethylammoniumethyl) phosphate (“phosphorylcholine” or “PC”) monomers have been developed and used on implant devices. PC containing polymers have been shown to have many beneficial properties. For example, PC containing polymers are typically sterilizable, biocompatible, made from commercially available reagents, have received regulatory approval for certain embodiments, and provide a controlled drug release rate for higher molecular weight drugs. However, PC coatings still need improvements with regard to adhesion. Specifically, PC containing polymers have relatively poor adhesion to many implantable medical devices. The lack of good adhesion can necessitate the use of a primer to improve bonding, which can complicate the manufacture and use of the implantable device. The embodiments of the invention relate to copolymers with zwitterion moieties and implantable medical devices coated with the zwitterionic copolymers. In addition to the zwitterion moiety, the co-polymers of embodiments of the invention include a dihydroxyphenyl moiety that provides improved adhesion to the surface of a medical device. The copolymers of embodiments of the invention can be manufactured by copolymerizing a zwitterionic monomer with a dihydroxyphenyl monomer to yield a thermoplastic polymer. The copolymers can optionally include a cationic amino monomer, a hydrocarbon monomer, and/or a hydrophilic monomer. 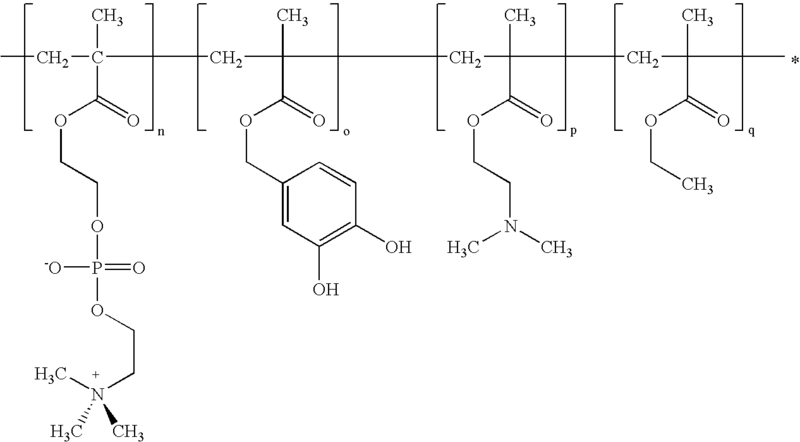 In the foregoing formula, R1-R4 are independently a methacryl, acryl, styryl, acrylamido, methacrylamido, sulfovinyl, amido, ester, ethyl, or propyl; R5 is a hydrocarbon chain, cycloaliphatic group, ester group, amide group, thiol, sulfone, carbonate, saccharide, PEG, or combination thereof; R6 includes a zwitterion group, a linker being a chain of 2-12 carbon atoms, and an ester or amide attachment to the methacryl group; R7 is a methyl, ethyl, or hydrogen group; n is in a range from about 0.005 to about 0.5; o is in a range from about 0.005 to 0.4; p is optionally included in a range from 0.005 to 0.25; q is in a range from 0.005 to 0.98; and r is optionally included in a range from 0.005 to 0.4. In one example embodiment, n+o+p+q+r=1. Embodiments of the invention relate to copolymers for use as a coating on implantable medical devices. The copolymers include a zwitterionic monomer (e.g., methacryloyloxyethyl phosphorylcholine monomer), an ortho-dihydroxyphenyl derivatized monomer, and one or more additional, optional monomers. For purposes of this invention, the term acrylate monomer includes monomers that are methacrylates or acrylates. Alternatively, the zwitterionic group may be a betaine group (i.e., in which the cation is closer to the backbone), for instance a sulpho-, carboxy- or phosphor-betaine. In an embodiment, the betaine group has the formula -A4-R3—N+(R4)2—R5—V−, in which A4 is a valence bond, —O—, —S—, or —NH—; V is a carboxylate, sulphonate or phosphate diester (monovalently charged) anion; R3 is a valence bond (together with A4) or alkanediyl, —C(O)alkylene- or —C(O)NH alkylene; the groups R4 are the same or different and each is hydrogen or alkyl of 1 to 4 carbon atoms or the groups R4 together with the nitrogen to which the are attached form a heterocyclic ring of 5 to 7 atoms; and R5 is an alkyanediyl of 1 to 20 carbon atoms, of 1 to 10 carbon atoms, or of 1 to 6 carbon atoms. 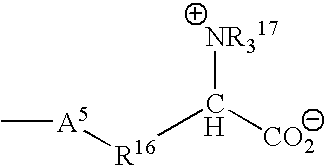 In the foregoing formula, A5 is a valence bond, —O—, —S—, or —NH—; R16 is a valence bond (optionally together with A5) or alkanediyl, —C(O)alkylene- or —C(O)NH alkylene; the groups R17 are the same or different and each is hydrogen or alkyl of 1 to 4 carbon atoms or the groups R4 together with the nitrogen to which the are attached form a heterocyclic ring of 5 to 7 atoms; and R5 is an alkyanediyl of 1 to 20 carbon atoms, of 1 to 10 carbon atoms, or of 1 to 6 carbon atoms. 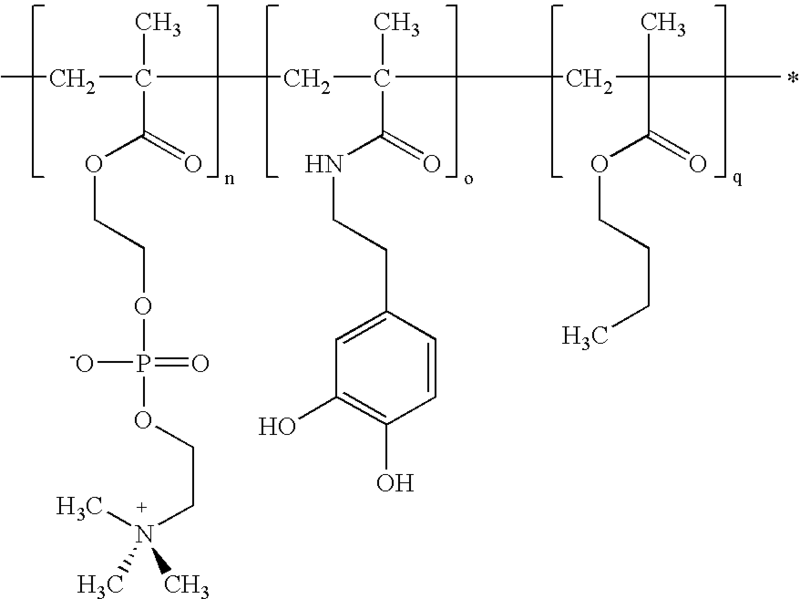 The dihydroxyphenyl monomers of the embodiment invention include a dihydroxyphenyl moiety to enhance the adhesion of the polymeric coating to a medical device. 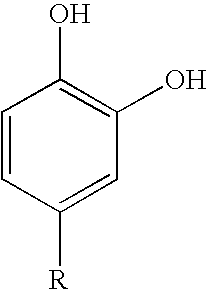 The dihydroxyphenyl moiety can be an ortho-dihydroxy catechol group, also referred to as 3,4-dihydroxyphenyl, or a 2,3-dihydroxyphenyl group. The chemical structure of a monomer that includes a 3,4-dihydroxyphenyl moiety is shown below. Dihydroxyphenyl moieties have good adhesion to metal hydroxides and other substrates. Mussel adhesion proteins, which are known to bind to a large variety of substrates in an aqueous environment, include large percentages of dihydroxyphenyl moieties, primarily 3,4-dihydroxyphenyl-L-alanine (DOPA). Studies have shown that the adhesion that mussel proteins have for rocks, wood, and metal is due in large part to the modified amino acid DOPA.1 The dihydroxyphenyl moiety of DOPA bonds tenaciously to inorganic, metal, and metal oxide surfaces. By incorporating a dihydroxyphenyl moiety into the copolymers of the invention, the copolymers of the invention can have enhanced bonding to various surfaces and substrates. In particular, enhanced bonding can be achieved for the surfaces of stainless steel, titania, and nitinol (a superelastic nickel-titanium alloy) based medical devices. Improved bonding can also be achieved between the copolymers of the invention and living tissue. DOPA has been shown to have an adhesive interaction with polysaccharides and mucin.2 Since mucin is a component of all mucous membranes, the copolymers of the invention can have an improved affinity for the lining of the arterial wall. This adhesion can assist in maintaining the implantable device in the desired location within the patient's body. 1 2. Lee B. P., et al. Biomacromolecules 2002, 3, 1038-1047.2 4. Kui H., et al. Biomacromolecules 2002, 3, 397-406. The dihydroxyphenyl monomer also includes a polymerizable group. The polymerizable group is selected to be suitable for copolymerization with the zwitterionic monomer. Examples of suitable polymerizable groups include methacryl, acryl, styryl, acrylamido, methacrylamido, sulfovinyl, amido, ester, ethyl, propyl groups, combinations of these, and the like. The polymerizable group and the dihydroxyphenyl moiety can be separated by a spacer group. The spacer group can be a hydrocarbon chain, cycloaliphatic group, ester group, amide group, thiol, sulfone, carbonate, saccharide, PEG, or combination of these or the like. The spacer group allows for proper spacing of the dihydroxyphenyl moiety from the copolymer carbon backbone chain to facilitate binding between the dihydroxyphenyl moiety and the surface of a substrate. In one embodiment, the dihydroxyphenyl monomer can be included in the copolymers of the invention in a range from about 1.0 mol % to about 50 mol %. Additional monomers can optionally be included in the copolymers of the invention to impart desired properties. In one embodiment, the zwitterion copolymer includes a cationic amine monomer. The cationic amine monomer has a cationic amine side group to further enhance the adhesion of the copolymer to metal surfaces, which are typically anionic. 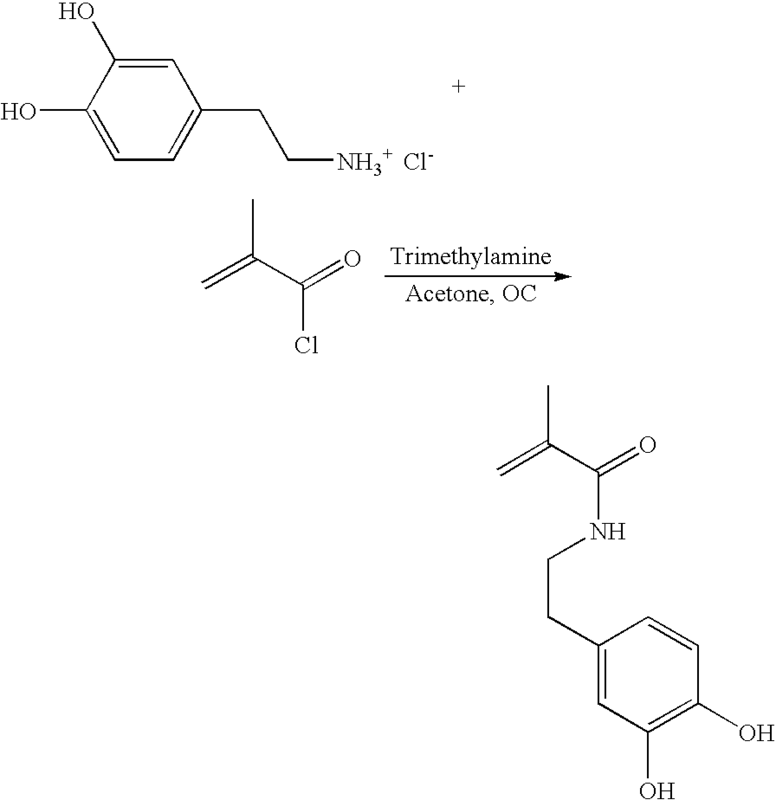 Examples of a suitable cationic amino monomers include N,N′-diethylaminoethyl methacrylate, 2-(dimethylamino)ethyl methacrylate, 2-aminoethyl methacrylate, N-(3-aminopropyl) methacrylamide, 2-(diethylamino)ethyl styrene, 2-(dimethylamino)ethyl acrylate, N-(2-(N,N′-dimethylamino)ethyl) methacrylamide, N-(3-(N,N′-dimethylamino)propyl) acrylamide, and N-(3-N,N′-dimethylamino)propyl methacrylamide. The copolymers of the invention may include the cationic amine monomer in an amount in a range from about 0.0 mol % to about 25 mol %. The cationic amine monomer can be included alone or in combination with a hydrocarbon monomer and/or a hydrophilic monomer. Another additional monomer that can be included in embodiments of the copolymers of the invention is a hydrocarbon monomer. The hydrocarbon monomer includes a hydrocarbon side group to provide non-specific adhesion and/or to modify polymer properties including water swelling and mechanical strength. The hydrocarbon group can be a straight chain, branched, unsaturated or cyclic hydrocarbon of one to sixteen carbon atoms. Examples of suitable hydrocarbon sidegroups include alkyl, alkenyl, aryl, arylalkyl, alkylaryl, arylkenyl or alkenylaryl sidegroups. Examples of suitable hydrocarbon monomers include ethyl methacrylate, n-butyl methacrylate, lauryl-methacrylate, methyl methacrylate, isopropyl methacrylate, n-propyl methacrylate, isobutyl methacrylate, sec-butyl methacrylate, tert-butyl methacrylate, n-hexyl methacrylate, cyclohexyl methacrylate, 2-ethylhexyl methacrylate, phenyl methacrylate, benzyl methacrylate, isobornyl methacrylate, trimethylcyclohexyl methacrylate, n-dodecyl methacrylate, methacrylates with pendant groups comprising up to 16 carbons, methyl acrylate, ethyl acrylate, propyl acrylate, n-butyl acrylate, isobutyl acrylate, sec-butyl acrylate, n-hexyl acrylate, cyclohexyl acrylate, phenyl acrylate, benzyl acrylate, styrene, alkyl substituted styrene, ethylene, propylene, 1-butene, and isobutylene. In an embodiment, the amount of hydrocarbon monomer in the copolymers can be in a range from about 0.0 mol % to about 98 mol %. The hydrocarbon monomer can be included alone or in combination with a cationic amine monomer and/or a hydrophilic monomer. 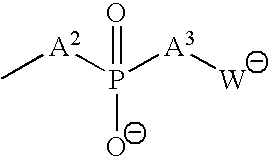 The optional hydrophilic monomer includes a hydrophilic side group to further modify the polymer's properties. For example, the hydrophilic monomer can be included to increase water swelling and thus drug permeability. Examples of suitable hydrophilic monomers include hydroxyethyl methacrylate (HEMA), hydroxy propyl methacrylate (HPMA), acrylamide, methacrylamide, hydroxyalkyl methacrylamides, 2-hydroxyethyl methacrylate, 3-hydroxypropyl methacrylate, 2-hydroxypropyl methacrylate, hydroxybutyl methacrylate, acrylic acid, methacrylic acid, 2-methoxyethyl acrylate, 2-methoxyethyl methacrylate, 2-ethoxyethyl methacrylate, PEG-methacrylate, PEG-acrylate, polypropylene glycol acrylate, polypropylene glycol methacrylate, vinyl pyrrolidone, allyl alcohol, vinyl sulfonic acid, 2-sulfoethyl methacrylate, 3-sulfopropyl methacrylate, and styrene sulfonic acid. In one embodiment, the amount of hydrophilic monomer in the copolymers of the invention is in a range from about 0.0 mol % to about 40 mol %. The hydrophilic monomer can be included alone or in combination with a cationic amine monomer and/or a hydrocarbon monomer. 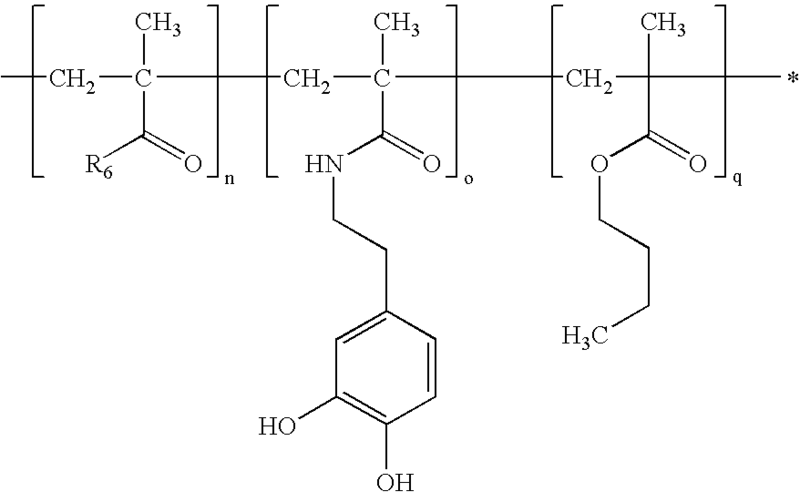 In the foregoing formula, R1-R4 are independently a methacryl, acryl, styryl, acrylamido, methacrylamido, sulfovinyl, amido, ester, ethyl, or propyl; R5 is a hydrocarbon chain, cycloaliphatic group, ester group, amide group, thiol, sulfone, carbonate, saccharide, PEG, or combination thereof; R6 includes a zwitterion group, a linker being a chain of 2-12 carbon atoms, and an ester or amide attachment to the methacryl group; R7 is a methyl, ethyl, or hydrogen group; n is in a range from about 0.005 to about 0.5; o is in a range from about 0.005 to 0.4; p is optionally included in a range from 0.005 to 0.25; q is in a range from 0.005 to 0.98; and r is optionally included in a range from 0.005 to 0.4. In one embodiment, n+o+p+q+r=1. Unless otherwise stated, the monomers shown in the chemical formula above and other chemical formulas herein can be in any order within the copolymer molecule and the monomer linkages shown in the chemical formulas only represent that the monomers are part of the same copolymer molecule. Furthermore, unless otherwise stated, the polymeric molecules can include monomers other than those shown in the chemical formulas. In the foregoing formula, R1-R4 are independently a methacryl, acryl, styryl, acrylamido, methacrylamido, sulfovinyl, amido, ester, ethyl, or propyl; R5 is a hydrocarbon chain, cycloaliphatic group, ester group, amide group, thiol, sulfone, carbonate, saccharide, PEG, or combination thereof; R6 includes a zwitterion group, a linker being a chain of 2-12 carbon atoms, and an ester or amide attachment to the methacryl group; R7 is a methyl, ethyl, or hydrogen group; n is in a range from about 0.005 to about 0.5; o is in a range from about 0.005 to 0.4; p is optionally included in a range from 0.005 to 0.25; q is in a range from 0.005 to 0.98; and r is optionally included in a range from 0.005 to 0.4. In this embodiment, the dihydroxy groups are in the 2,3 position. In the foregoing formula, the cationic amino group, the hydrocarbon group, and the hydrophilic group can be any suitable cationic, hydrocarbon, or hydrophilic group, respectively, including those listed above. The method of manufacturing the copolymers of the invention includes reacting a phosphorylcholine including monomer with a monomer including an ortho-dihydroxyphenyl compound. The copolymers can be synthesized using free radical polymerization, atom transfer radical polymerization, cationic polymerization, anionic polymerization, iniferter polymerization, or other suitable reactions techniques. Free radical polymerization can be carried out in a solvent using an initiator. Examples of solvents suitable for carrying out the polymerization reaction include alcoholic solvents, such as, but not limited to, methanol, ethanol, and isopropanol. Examples of suitable initiators for carrying out the polymerization reaction include peroxides, such as, but not limited to, benzoyl peroxide, and azo compounds. A specific example of a suitable initiator is 2,2′-azo-bis(2-methylpropionitrile). Those skilled in the art are familiar with the conditions for carrying out the foregoing polymerization reactions and other similar polymerization reactions suitable for yielding the copolymers of the invention. In one embodiment, the copolymer compositions are manufactured to have a desired Tg, when hydrated. The Tg of the copolymer can be calculated by knowing the amount of water absorbed and the Tg derived from measurements of the homopolymer of the respective monomers. In an embodiment, the Tg is calculated using the Fox equation, which is shown below. Once the water absorption of the polymer is known, which is usually measured experimentally, the copolymer Tg can be estimated with the desired target. In one embodiment the desired target Tg is in a range from about −30° C. to about 37° C. when in the fully hydrated state. In another range, the Tg is between about 0° C. and about 37° C. when hydrated. With a Tg of less than 37° C., the copolymers will have a high degree of polymer mobility when placed in vivo. This feature allows the surface of the polymer to enrich in zwitterionic monomer content, which is advantageous for biocompatibility. In an alternative embodiment, the copolymer is designed to have a desired Tg for the polymer in the dry state. In an embodiment, the Tg of the polymer when dry is in a range from about −30° C. to about 100° C. or in a range from about 0° C. to about 70° C.
The polymerization reaction can be controlled to produce the copolymers with a desired molecular weight. In one embodiment, the number average molecular weight of the copolymer is in the range from about 20 K to about 800 K and in another range from about 100 K to about 600 K.
In an alternative embodiment, the number average molecular weight of the polymer is selected to provide adhesion. In this embodiment, the molecular weight can be in a range from about 2 K to about 200 K. The adhesive polymer can be used on medical devices that benefit from an adhesive polymer coating. The copolymers of embodiments of the invention can be manufactured substantially free of cross-linking. Copolymers manufactured according to the invention have sufficient mechanical strength when hydrated that cross-linking is not necessary for making a polymer coating suitable for coating an implantable device. The absence of cross-linking can give the copolymers improved elasticity, particularly when dry, which reduces the likelihood of cracking during assembly and use. The 3,4-dihydroxyphenyl substituted monomers can be made by reacting a polymerizable group with an ortho-dihydroxyphenyl compound. These reactions are typically carried out using known reaction conditions. An example of a suitable reaction for forming a 3,4-dihydroxyphenyl substituted monomer is shown below. In the forgoing reaction, dopamine hydrochloride is reacted with methacryloyl chloride to yield 2-(3,4-dihydroxyphenyl)-ethyl methacrylamide. Dopamine hydrochloride and methacryloyl chloride are commercially available compounds (e.g., from Aldrich). 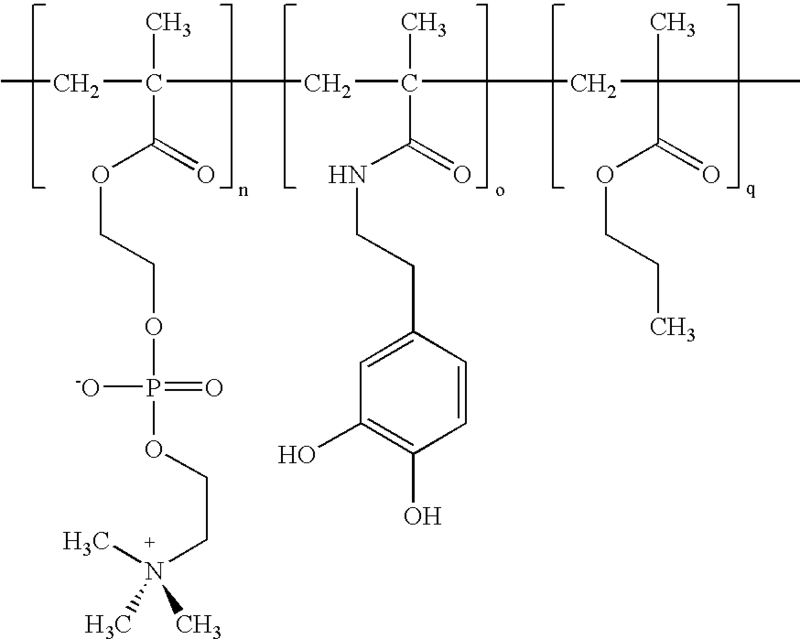 Alternately, the dihydroxyphenyl group can be coupled to the polymer backbone after the polymerization is performed. In one such example, the polymerization is done with methacrylic acid instead of the 2-(3,4-dihydroxyphenyl)-ethyl methacrylamide. After the polymer is isolated, dopamine is coupled to the pendant carboxylic acid groups with, for example, dicyclohexylcarbodiimide. The foregoing copolymers are suitable for use on any medical device that is compatible with polymer coatings. The copolymers can be used alone as a coating or can be combined with other polymers or agents to form a polymer coating. For example, the polymers may be blended with poly(vinyl pyrrolidinone), poly(n-butyl methacrylate), poly(n-butyl methacrylate) copolymers, methacrylate polymers, acrylate polymers, and/or a terpolymers of hexyl methacrylate, vinyl acetate, and vinyl pyrrolidinone. The polymer coatings can be applied to a medical device using any techniques known to those skilled in the art or those that may be developed for applying a coating to a medical device. Examples of suitable techniques for applying the coating to the medical device include spraying, dip coating, roll coating, spin coating, powder coating, and direct application by brush or needle. One skilled in the art will appreciate the many different techniques in powder coating. The copolymers can be applied directly to the surface of the implant device, or they can be applied over a primer or other coating material. In one embodiment, the polymer coating is applied to a medical device using a solvent-based technique. The polymer can be dissolved in the solvent to form a solution, which can be more easily applied to the medical device using one or more of the above mentioned techniques or another technique. Thereafter substantially all or a portion of the solvent can be removed to yield the polymer coating on a surface of the medical device. Examples of suitable solvents that can be used with the copolymers of the invention include, but are not limited to, dimethylacetamide (DMAC), dimethylformamide (DMF), tetrahydrofuran (THF), dimethylsulfoxide (DMSO), cyclohexanone, xylene, toluene, acetone, n-butanol, i-propanol, methyl ethyl ketone, propylene glycol monomethyl ether, methyl t-butyl ketone, methyl isobutyl ketone, ethyl acetate, n-butyl acetate, ethanol, methanol, chloroform, trichloroethylene, 1,1,1-trichloreoethane, methylene chloride, and dioxane. Solvent mixtures can be used as well. Representative examples of the mixtures include, but are not limited to, DMAC and methanol (50:50 w/w); water, i-propanol, and DMAC (10:3:87 w/w); i-propanol and DMAC (80:20, 50:50, or 20:80 w/w); acetone and cyclohexanone (80:20, 50:50, or 20:80 w/w); acetone and xylene (50:50 w/w); and 1,1,2-trichloroethane and chloroform (80:20 w/w). FIG. 1A shows an example stent 10 coated with a copolymer that includes dihydroxyphenyl moieties. Stent 10 includes a generally tubular body 12 with a lumen. The struts of body 12 (e.g. strut 14) provide a supporting structure for coating the polymers of the invention. FIG. 1B illustrates a cross-section of the stent of FIG. 1A coated with a polymer coating 16 according to the invention. The polymer coating 16 can be conformal as in FIG. 1B. Alternatively, the coating can be ablumenal, luminal, or any combination thereof. In one embodiment, the copolymers of the invention are elastic at body temperatures and can therefore expand without cracking as the stent expands during use. The polymer coated stents of the invention can be self-expanding or balloon expandable. The copolymer coatings of the invention can be particularly advantageous for self expanding stents. Self expanding stents are typically restrained by a sheath that is removed during deployment of the stent. The copolymers of the invention can have improved mechanical strength to better withstand the friction exerted on the polymer as the sheath is removed. In one embodiment, a bioactive agent is associated with the coated medical devices of the invention. The bioactive agent can be associated with a base coat, top coat, mixed with the novel copolymers of the invention, and/or incorporated or otherwise applied to a supporting structure of the medical device. The bioactive agent can have any therapeutic effect. Examples of suitable therapeutic properties include anti-proliferative, anti-inflammatory, antineoplastic, antiplatelet, anti-coagulant, anti-fibrin, antithrombonic, antimitotic, antibiotic, antiallergic and antioxidant properties. Examples of suitable bioactive agents include synthetic inorganic and organic compounds, proteins and peptides, polysaccharides and other sugars, lipids, DNA and RNA nucleic acid sequences, antisense oligonucleotides, antibodies, receptor ligands, enzymes, adhesion peptides, blood clot agents, including streptokinase and tissue plasminogen activator, antigens, hormones, growth factors, ribozymes, retroviral vectors, anti-proliferative agents including rapamycin (sirolimus), 40-O-(2-hydroxyethyl)rapamycin (everolimus), 40-O-(3-hydroxypropyl)rapamycin, 40-O-(2-hydroxyethyoxy)ethylrapamycin, 40-O-tetrazolylrapamycin (zotarolimus, ABT-578), 40-epi-(N1-tetrazolyl)-rapamycin, 40-O-[2-(2-hydroxy)ethoxy]ethyl-rapamycin, Biolimus A9 (biosensors International, Singapore), deforolimus, AP23572 (Ariad Pharmaceuticals), paclitaxel, docetaxel, methotrexate, azathioprine, vincristine, vinblastine, fluorouracil, doxorubicin hydrochloride, mitomycin, antiplatelet compounds, anticoagulants, antifibrin, antithrombins including sodium heparin, low molecular weight heparins, heparinoids, hirudin, argatroban, forskolin, vapiprost, prostacyclin, prostacyclin analogues, dextran, D-phe-pro-arg-chloromethylketone (synthetic antithrombin), dipyridamole, glycoprotein IIb/IIIa platelet membrane receptor antagonist antibody, recombinant hirudin, thrombin inhibitors including Angiomax ä, calcium channel blockers including nifedipine, colchicine, fibroblast growth factor (FGF) antagonists, fish oil (omega 3-fatty acid), histamine antagonists, lovastatin, monoclonal antibodies, nitroprusside, phosphodiesterase inhibitors, prostaglandin inhibitors, suramin, serotonin blockers, steroids, thioprotease inhibitors, triazolopyrimidine, nitric oxide or nitric oxide donors, super oxide dismutases, super oxide dismutase mimetic, estradiol, anticancer agents, dietary supplements including vitamins, anti-inflammatory agents including aspirin, tacrolimus, dexamethasone, dexamethasone acetate, dexamethasone phosphate, momentasone, cortisone, cortisone acetate, hydrocortisone, prednisone, prednisone acetate, betamethasone, betamethasone acetate, clobetasol, cytostatic substances including angiopeptin, angiotensin converting enzyme inhibitors including captopril, cilazapril or lisinopril, antiallergic agents is permirolast potassium, alpha-interferon, bioactive RGD, and genetically engineered epithelial cells. Other bioactive agents which are currently available or that may be developed in the future for use with DESs may likewise be used and all are within the scope of this invention. 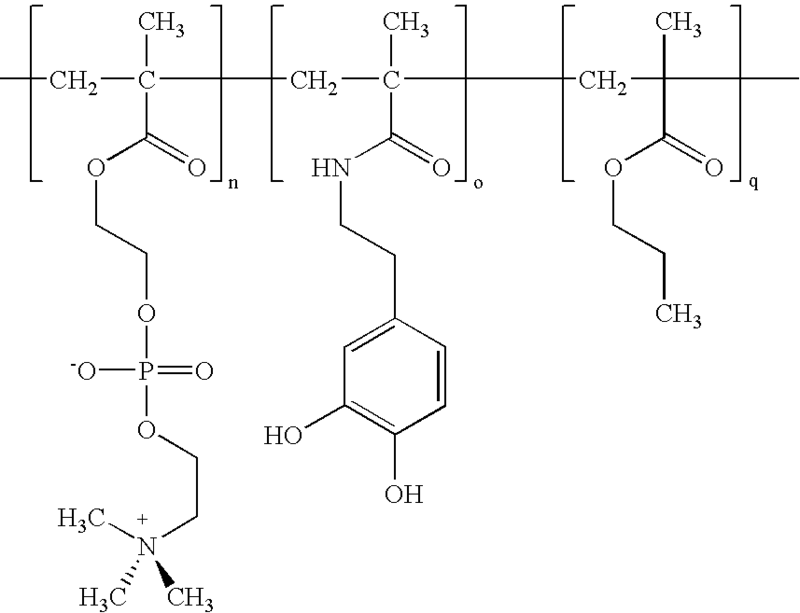 The following are specific examples of copolymers of phosphorylcholine monomers and ortho-dihydroxyphenyl monomers. The following zwitterionic copolymers are useful for coating implantable medical devices. Example 1 describes a copolymer of PC, 2-(3,4-<dihydroxylphenyl)ethylmethacrylamide, and n-butyl methacrylate. In this copolymer, the n-butyl methacrylate moderates the hydrophilicity of the polymer and enhances the polymers mechanical properties. Percent ranges (mol %) for the monomers are 1%-50% for n, 1%-40% for o, and 10%-98% for q. Example 2 describes a copolymer of PC, 2-(3,4-dihydroxylbenzyl)-methacrylamide, N—N-dimethylaminoethyl methacrylate, and ethyl methacrylate. In this copolymer, the dimethylaminoethyl methacrylate enhances the adhesion to anionic surfaces such as, but not limited to, metal oxides. Cationic monomers can enhance the adhesion but their use is typically moderated to avoid potential issues with regard to binding of fibrinogen and platelets. The ethyl methacrylate increases the hardness of the polymer. Percent ranges (mol %) for the monomers are 1%-50% for n, 1%-40% for o, 0.5%-25% for p, and 10%-97.5% for q. Example 3 describes a copolymer of PC, 2-(3,4-dihydroxylphenyl)ethylmethacrylamide, and n-propyl methacrylate. Compared to Example 1, the n-propyl methacrylate has a slightly higher Tg and is a harder monomer than n-butyl methacrylate. Thus, for a given monomer composition, this copolymer will be harder than the copolymer of Example 1. Percent ranges for the monomers are 1%-50% for n, 1%-40% for o, and 10%-98% for q. Example 4 describes a method for manufacturing a drug eluting stent coating using one or more of the polymers of Examples 1-3. In a first step, an optional primer coating is applied to the stent. A primer solution including between about 0.1 mass % and about 15 mass %, (e.g., about 2.0 mass %) of one of the copolymers of Examples 1-3, and the balance, a solvent mixture of ethanol and 1-butanol (having about 50 mass % of ethanol and about 50 mass % of 1-butanol) is prepared. The solution is applied onto a stent to form a primer layer. To apply the primer layer, a spray apparatus, (e.g., Sono-Tek MicroMist spray nozzle, manufactured by Sono-Tek Corporation of Milton, N.Y.) is used. The spray apparatus is an ultrasonic atomizer with a gas entrainment stream. A syringe pump is used to supply the coating solution to the nozzle. The composition is atomized by ultrasonic energy and applied to the stent surfaces. A useful nozzle to stent distance is about 20 mm to about 40 mm at an ultrasonic power of about one watt to about two watts. During the process of applying the composition, the stent is optionally rotated about its longitudinal axis, at a speed of 100 to about 600 rpm, for example, about 400 rpm. The stent is also linearly moved along the same axis during the application. The primer solution is applied to a 15 mm Triplex, N stent (available from Abbott Vascular Corporation) in a series of 20-second passes, to deposit, for example, 20 μg of coating per spray pass. Between the spray passes, the stent is allowed to dry for about 10 seconds to about 30 seconds at ambient temperature. Four spray passes can be applied, followed by baking the primer layer at about 80° C. for about 1 hour. As a result, a primer layer can be formed having a solids content of about 80 μg. For purposes of this invention, “Solids” means the amount of the dry residue deposited on the stent after all volatile organic compounds (e.g., the solvent) have been removed. In a manner similar to the application of the primer layer, a polymer-therapeutic solution is prepared and applied using the following formula. The drug-including formulation is applied to the stent in a manner similar to the application of the copolymer primer layer. The process results in the formation of a drug-polymer reservoir layer having a solids content between about 30 μg and 750 μg, (e.g., about 225 μg) and a drug content of between about 10 μg and about 250 μg, (e.g., about 75 μg). r is optionally included in a range from about 0.005 to about 0.4. 2. A biocompatible polymer as in claim 1, wherein n+o+p+q+r=1. 3. A biocompatible polymer as in claim 1, wherein a 3,4-dihydroxyphenyl group is substituted with a 2,3-dihydroxyphenyl group. 4. A biocompatible polymer as in claim 1, in which the zwitterion group is selected from the group consisting of phosphorylcholine, phosphoryl ethanolamine, phosphatidyl ethanolamine, phosphoethanolamine, phosphatidyl serine, sulfobetaine and combinations thereof. 5. A biocompatible polymer as in claim 1, in which the glass transition temperature of the polymer when hydrated is in a range from about −30° C. to about 37° C.
6. A biocompatible polymer as in claim 1, in which the glass transition temperature of the polymer when dry is in a range from about −30° C. to about 100° C.
7. A biocompatible polymer as in claim 1, in which the polymer is substantially free of cross-linking. 8. A medical device coating comprising the biocompatible polymer of claim 1.
q is in a range from about 0.1 to about 0.98. 10. A biocompatible polymer as in claim 9, in which R6 is selected from the group consisting of phosphorylcholine, phosphoryl ethanolamine, phosphatidyl ethanolamine, phosphoethanolamine, phosphatidyl serine, sulfobetaine and combinations thereof. 11. A medical device coating comprising the biocompatible polymer of claim 9. 13. A biocompatible polymer as in claim 12, in which R6 is selected from the group consisting of phosphorylcholine, phosphoryl ethanolamine, phosphatidyl ethanolamine, phosphoethanolamine, phosphatidyl serine, sulfobetaine and combinations thereof. 14. A medical device coating comprising the biocompatible polymer of claim 12. 16. A biocompatible polymer as in claim 14, in which R6 is selected from the group consisting of phosphorylcholine, phosphoryl ethanolamine, phosphatidyl ethanolamine, phosphoethanolamine, phosphatidyl serine, sulfobetaine and combinations thereof. 17. A medical device coating comprising the biocompatible polymer of claim 15. 18. A biocompatible polymer as in claim 1, in which the molecular weight of the polymer is in a range from about 20 kDa to about 800 kDa. 19. A biocompatible polymer as in claim 1, in which the molecular weight of the polymer is in a range from about 2 kDa to about 200 kDa. 20. A biocompatible coating comprising the biocompatible polymer of claim 1 blended with a polymer selected from the group consisting of poly(vinyl pyrrolidinone), poly(n-butyl methacrylate), poly(n-butyl methacrylate) copolymers, methacrylate polymers, acrylate polymers, and/or a terpolymers of hexyl methacrylate, vinyl acetate, and vinyl pyrrolidinone. 22. A medical device as in claim 21, in which n+o+p+q+r=1. FR2863617B1 (en) 2003-12-15 2006-01-20 Rhodia Chimie Sa Polymers comprising zwitterionic units of betaine type and use of zwitterionic polymers in drilling fluids.